These stoneware pots feature a timeless finish and can be used to perfectly cook stew, soups, beans, and rice pilafs. When camping, you can even leave this stoneware bean pot in the embers of a fire overnight and wake up to a beautifully cooked breakfast. This stoneware pot evenly distribute heat and holds 3 quarts of water to the brim. Ceramic bean pots are microwave, oven, freezer and dishwasher safe and are easy to clean. 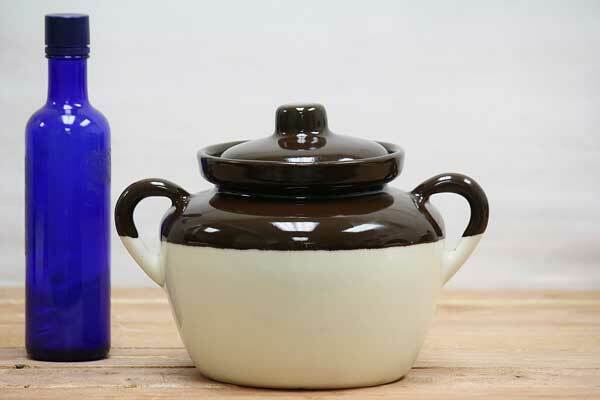 These classic bean pots are made in a America and contain no lead or harmful chemicals. We also offer ceramic pie dishes and loaf pans.